I'm just loving making my own background paper. Why haven't I been doing this all along??!! Stamp TV has so many wonderful instructional videos and I'm ready to try them all! Today I used the Rubber Band Embossing technique to create the background paper for my card. I also sponged the same inks onto "un-embossed" paper and used it for the backdrop of the main image and sentiment. Together they look spectacular and I plan on using this technique a lot in the next while, experimenting with different colors of embossing powders and inks. Hope you like. Accessories & Tools: Sizzix Die-cut Pine Tree, copper metal sheet .005 thickness (K&S Precision Metals), butane torch, hammering tool, gold embossing powder, heat tool, clear embossing powder, elastic bands, brayer, sponges, three small black jewels, sticky strips, adhesives & dimensionals. 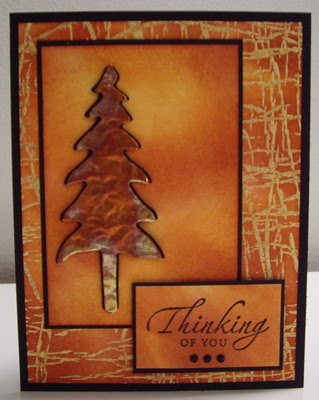 Using my Big Shot, I cut out the pine tree die-cut using the copper sheet. I heated the tree with a butane torch until the metal turned different colors. After it cooled, I used the end of my eyelet setting tool (anything that is hard and has a small tip will work) to "hammer" a finish onto the tree. I used the 4"x2" piece of black cardstock to cut out another pine tree. I cut it down the middle and mounted each side behind the copper tree to make a "shadow" effect. I "Rubber Band Embossed" the large piece of Whisper White cardstock. Then, using my Colorbox sponges (any sponge will do), I randomly sponged on all pieces of Whisper White with So Saffron, Pumpkin Pie and Cajun Craze inks. I also sponged Cajun Craze along the edges of each piece. I stamped the sentiment with Basic Black ink and embossed with clear powder. I mounted all the pieces as shown in the picture above, popping up the copper tree and sentiment with dimensionals to add depth. To finish I added three small "jewels" at the bottom of the sentiment. Labels: copper, heat embossing, masculine, mixed media, rubber band technique, sponging, Stampin' Up!